"Professor Martin Wolfe; a Professor of Plant Pathology worked for 28 years at the Plant Breeding Institute in Cambridge, followed by nine years in Switzerland and since 1998 and ‘retirement’ has worked for the Organic Research Centre and latterly Coventry University. Since 1997 he has been a partner in and run Wakelyns Agroforestry a highly innovative, integrated (organic) agroforestry farm in Suffolk, east of England. "Martin has a B.Sc. (Hons Agric. Bot.) University of Reading, 1960 and a Ph.D. University of Cambridge, 1963 and a life dedicated to the pursuit of knowledge. It has been a career of research in and into agricultural systems. Martin is a pioneer in working in multi-disciplinary context and an agroecological framework, with first-hand experience of both crop and livestock research as well as farm management and the environment. This has come together, and can be seen, in his passion for an equitable and sustainable food system and on the ground at Wakelyns. "From his early work at PBI through to his current research, being carried out both on Wakelyns and with the numerous research projects he is engaged with, he has championed population breeding and composite cross populations. This has its roots in landraces and he is clearly the ‘father’ of the 1st population to be marketed in the EU under the recent marketing experiment – fittingly named the ‘ORC Wakelyns Population’. Thanks to Martin’s outstanding capabilities in inspiring his students and collaborators to think independently and out of the box, the population and cross breeding work has by now also created a scientifically and practically rooted “Composite Cross Community” throughout Europe dedicated to agroecology based on diversity at all levels from the microorganisms up to humans and landscapes. 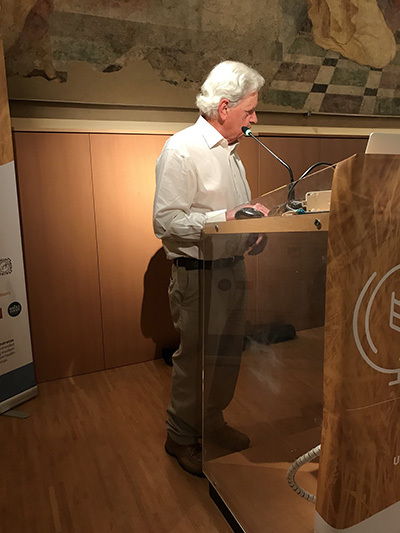 "We present this lifetime achievement award to Professor Martin Wolfe for his services to plant breeding, diversity, the environment and sustainable food production."